I hear you, you want to make this years awards banquet the best one ever. Here are some awards banquet ideas to really give your event an upgrade. For many companies and organizations the annual awards banquet is an important event to recognize accomplishments in front of and with the entire team. Annual awards can improve engagement and service by providing focus on goals, but I know coming up with awards banquet ideas to make the evening special can sometimes be difficult. Over the years I have been lucky enough to perform at many volunteer and employee recognition events all over the country. In this article I am going to share with you some of the best ideas I have come across in the years of doing awards dinners and events. I know you will find something useful here. Your awards banquet should be a special night and everyone should feel a part of it. 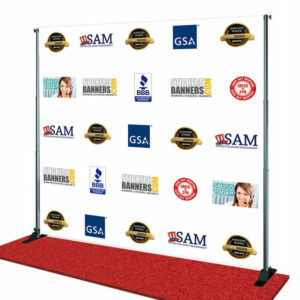 Having a red carpet at the entrance to the event is a simple way to let everyone know that tonight is special. Bonus points if you get everyone to ham it up! Double bonus points if you have an emcee announcing guests as they come down the red carpet. Set a tone of celebration and fun. What does your company do to set the tone at your awards dinner? This is not a conference or a convention this is an awards dinner- a big night. Creating a clever invitation or at least having a tickets let’s everyone know that this is no ordinary evening. Make it really special by mailing them out instead of just passing the word around the office. Invitations also help build anticipation for the event. 3. The Simplest of Awards Banquet Ideas – Name Tags! Take the pressure off awards dinner guests. Simple name tags make it easy for people to mix and mingle. You can give everyone clever titles like stunt double or executive producer instead of their regular titles. Better yet have them write their favorite movie under their names as a conversation starter. This is a fun, simple way to keep with the theme and help to break the ice. Big time awards banquets are always black tie events. Giving people a reason to dress up will make the evening stand out. Of course there will be people who grumble, ignore them, let them come dressed as they wish. The majority of attendees will have fun with it. After seeing hundreds of awards banquets we all know what is going to happen, everyone arrives and grabs a drink and waits for the doors to open. Instead imagine your guests encounter a mystery guest who uses hilarious comedy magic to help them connect with one another. When you hear loud bursts of laughter you will know your awards dinner is off to a great start. This is a simple way to recognize more people in your organization. The more people you recognize the bigger the night feels. It also gives the whole room a great positive feeling. Instead of a few people doing good work it feels like many people are succeeding. It is an honor just to be nominated! Meryl Streep always sits down front at the Oscars so when she wins she is just a few steps away from the podium. This simple seating decision make the winners feel special and helps with the flow of the whole evening. It sends a strong message when the executive team takes the best seats in the house and the winners sit in the back. In fact all seats should be assigned so that groups mix at dinner and build a stronger bond. What would happen if your company made sales and operations sit together at dinner? Great awards banquet ideas don’t have to hit your budget! No one is suggesting you put a $50,000 Rolex in the gift bags but a little something for people to take home at the end of the night soothes the fact that not everyone can win. You can ask you vendors for some goodies or fill it with company SWAG, a Starbucks gift card couldn’t hurt. Let’s face it, you can’t give an award to everyone, but you still need to send everyone out the door on a high note. All great awards shows have the best entertainment. 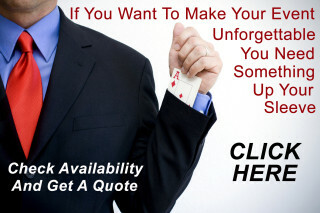 Corporate clean comedy entertainment after dinner will be the exclamation point to your event. If you are planning and awards dinner or any corporate event in the future I would love to collaborate with you to make it unforgettable. My email in on my profile page, I love to talk about events because events are what I do. Do you think your group would enjoy some laughs and amazing comedy magic after dinner? It’s all going to be over too quickly, before you know it will be Monday and everyone will be back to work. Throw an after party so everyone gets a chance to congratulate the winners and share the moment. Creating a hashtag is simple and it gives everyone a chance to share their photos. It gives a second life to your event, builds camaraderie and makes people look forward to next year. 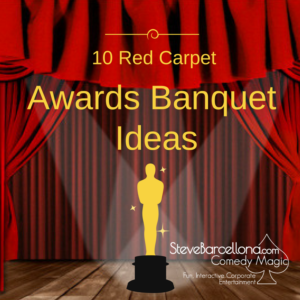 I hope one or two of these awards banquet ideas will help you upgrade your event. Employee recognition events in general are important ways to increase employee engagement, improve customers service and motivate people to believe in what is possible. Contact me if I can help you put an exclamation point on your awards dinner.